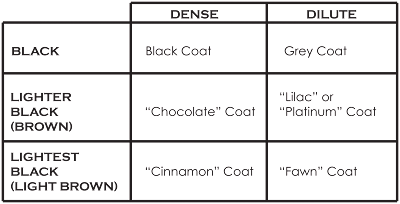 A Tonk's Tail... err, Tale...: Monday Medical: What's in a coat color? Well, after the earth-shattering discovery that da boyz are albinos, Allie demanded equal time. 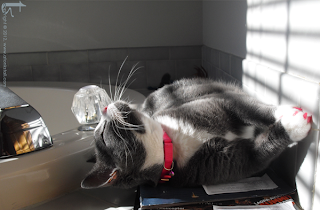 After all, she figured, if the Brats had cool, special genetic traits, then someone as stylishly adorable as her own grey-and-white self must have some, too. Right? Far be it from us to disagree with the Little Princess in the household! Truth is, Allie does have a few specially modified genes of her own. There are eight different genes that determine what a cat’s fur will look like. Some of them are more basic, while others are what you’d call modifiers – they change or overwrite the more foundational genes. (That’s what the albino gene does with the boys – it modifies their coat color by turning the color off at certain temperatures.) While Allie doesn’t have an active albino gene, she does have a different modifier. It’s responsible for the tuxedo white pattern in her coat. And it’s not only Allie. Some of our other friends in the blogosphere have the very same genetics. 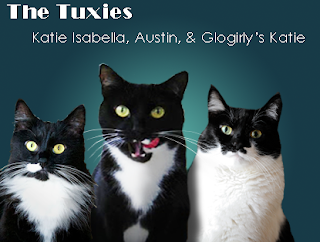 What is it in a cat’s genetic makeup that turns a moggie like Katie Isabella, Austin, or Glogirly’s Katie into a tuxedo kitty? The first stop in the flowchart of cat coloring is the following question: does your cat have black, orange, or white in its fur? If you said orange, then we’re going to refer you to JaneA’s excellent article on orange tabbies at paws and effect. This article will tackle the other two colors. So…question #1: is there any black in your cat’s coat? For Katie Isabella, Austin and Glogirly's Katie…the answer is YES! That means they have that black gene turned on full blast. Is there black in Allie’s coat? (trick question) Yep! Huh? The girl’s clearly grey, not black. True. But we’re not dealing with the black color, we’re dealing with the Black Gene – and it has 6 different settings. Take a look at the table below. A cat with an active black gene fits into one of these categories. They’re either set on high beam or low beam (full concentration or dilute), but their coloring can also come in one of 3 different concentrations. Austin and the Katies are all kitties with the black gene set on high beam. Allie’s is low beam – a diluted black. When you dilute black, what do you get? A gorgeous grey! Okay, now that we’ve cleared Step 1 (aka The Black Gene) let’s go on to the next step. That's our first modifier gene, the Albino Gene. If you’ve read our past posts on temperature-sensitive albinism, then you’ll know that this gene modifies coat color by turning the color off above a certain temperature. Anyone on our short list an albino? For Katie, Katie, Allie & Austin... nope, no albinos! Okay then. Albino Gene set in the OFF position. We can move on to the next gene. Next step, the Tabby Gene. 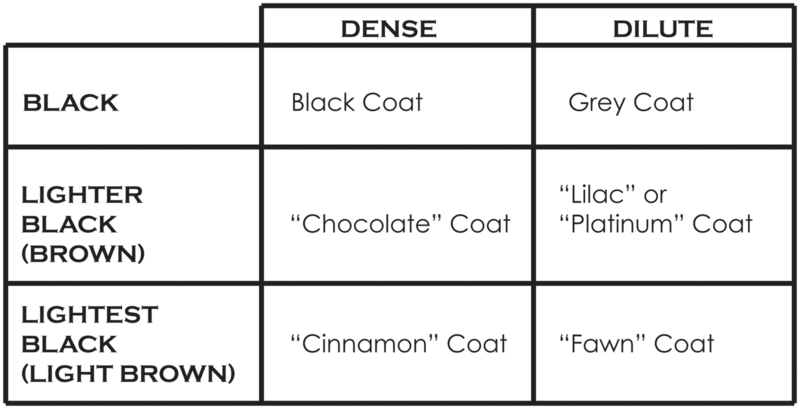 This gene modifies the black gene by introducing areas of the coat where the color is turned down - or off - in a certain pattern (that’s stripes, not plaid – sorry, style mavens). Any of you guys have stripes in your coats? Let’s see: doesn’t look as if Austin or the Katies do. The next stop is the White Gene. Technically this isn’t a color gene, it’s a masking gene. If a cat has this gene turned on, then the gene’s basically overwriting every single previous step we’ve gone through! This gene has three basic settings: low, medium and super-charged. If the White Gene’s turned all the way up to supercharged – well, then, you’re an all white cat. The supercharged setting is called the White Masking Gene and it’s designated as the “W” allele. If the setting’s on low, it’s called a Gloving Gene. 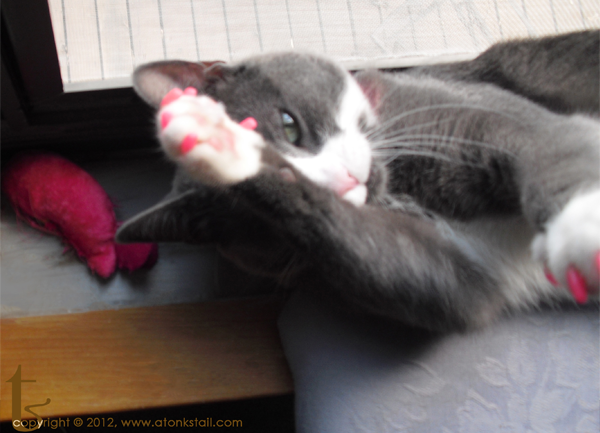 Like you’ve probably guessed from its name, it “puts gloves” on a cat, like our kitty model in the picture to the left. Hey, that’s what’s going on with those cool snowshoe kitties! If the setting’s on medium, that’s known as the Spotting Gene. And that’s what gives a cat that classic tuxedo look with a white blaze along the nose. And that classic white bib down the chest, too. 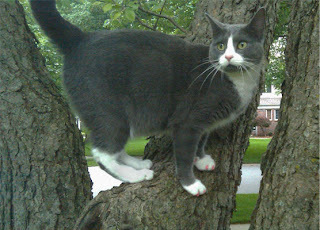 Of course we can’t leave out those dapper white “spats” on the paws, either! Tuxies come in lots of flavors: black tuxedos, grey tuxedos, orange tabby tuxedos, and and grey tabby tuxedos, to name a few. Geddy is a former Waif at Wayside Waifs where I volunteer (Allie's Alma Mater). 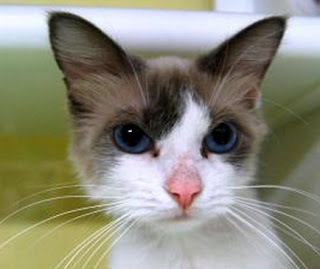 You can see she has the albino gene – she's a pretty chocolate point Siamese girl – but overlaying that is the spotting gene, and this masks all color. So Geddy's a Siamese Tuxie! Cool, huh? And as you can see in our three tuxedo models from the blogosphere, that tuxedo spotting pattern can vary from coat to coat, too! The “S” – or Spotting – Gene is also responsible for all other styles of black-and-white coat patterns, and the amount of white spotting can vary from just a teensy bit here and there to almost full-on white. In fact, often times a cat we think of as a white cat really isn’t. At least, not genetically speaking. If there’s even one colored hair anywhere on a kitty’s body, then the cat doesn't have the White Masking gene – just a really active Spotting gene instead. Oh, and we can’t forget our sassy calicos, torties and torbies! You’ll find the spotting gene turned on in the calicos - and occasionally in the torties and torbies - as well. But these sassy cats' coats, often called Mother Nature's idea of abstract art, are topics for another post! 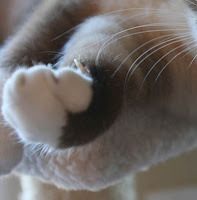 This is all very interesting and of course, my assistant goes nuts with all these beautiful pictures of Siamese and tuxedo kitties! Ditto Pip. Have a great Monday. How fascinating. I, of course, have the temperature sensitive albino gene and I am not dilute. Ichiro, well he's just messed up with a bunch of stuff. 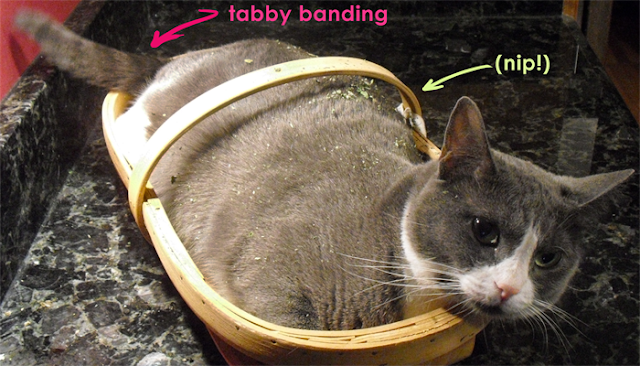 How do tabbies get their stripes? oooh that's the TABBY gene. It's either on or off. With us boyz it's off. Allie's got it going on down south (MOL)! MOWZERS! We're gonna hafta get Momma on that one! ooh yeah, Doc's totally supercharged! MOL! Loved his "gratuitous" pic today! There is nothing random about our fur! Marley, dude, no worries. It makes our heads hurt too. MOL! Momma sez that the whole orange thang is a Different Matter! That just means you're a Complex Mancat. Allie: oooh *squee! * We're STARS! That was very fascinating! 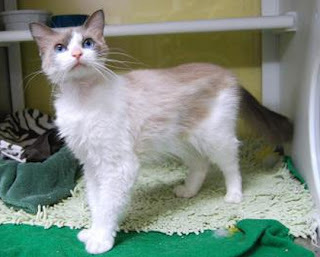 I am a dilute calico! Maxwell: *earnest look* and a very PURTY one too Daisy! That was really interesting! Ernie's got a teeny tiny bit of white furs mixed in with his black..guess that means he's got the spot gene!! This is so interesting. Many people don't realize that silver shaded Persians (that's what we are) start off as dark tabby colored kittens and the white comes in as we get older. Truffle is a much darker silver and Brulee only has a few tips of silver. Coloring is so fascinating! Hmm, So I guess me is a albnino and Kozmo is like yous - but hes black with a low masking gene. Cool! Me loves leaning cool things!